At one point during what he reminds Toronto is "the last Gambino tour ever," Donald Glover disappears. After a beat, he is revealed on the two jumbo screens abutting the stage to be ducking and scrambling underneath the stage. Security and a videographer follow the artist as he squeezes through a narrow passage in the bowels of Scotiabank Arena, past the Raptors dressing room, up two flights of stairs and through a mostly empty 100-level concourse, taking swigs from a champagne-shaped bottle of water as he speed-walks. The whole adventure is projected in real time to a packed audience. As the show's star scoots past a beer concession stand you recognize as the one closest to your seat and veers hard right, you realize he's entering 119 — your section. Childish Gambino is going out on top with this 19-date farewell "experience" (Glover's word). And now he's quite literally coming out up top. There Glover is, sweaty and shirtless, close enough to give dap, which he does with a couple fans before setting up temporary shop on the sticky staircase like a hot dog vendor. Inviting his cameraman close, he performs a sweet, intimate version of "Stand Tall" for the lower bowl but — judging all the smartphones alight — broadcast everywhere. The 34-year-old renaissance man is a octuple threat at the height of his careers. Glover can sing, rap and DJ. He can write, act, direct and kill a standup comedy routine. And, woo boy, can Lando Calrissian 2.0 dance. 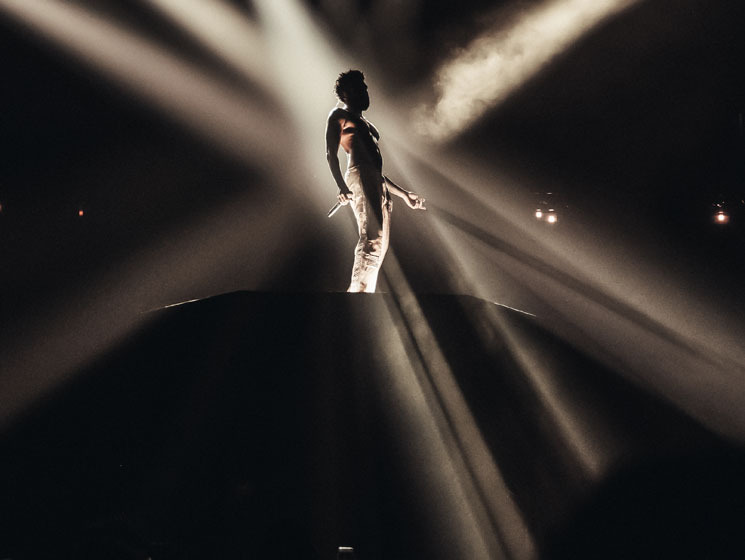 While his exhilarating, relentless "This Is America Tour" — named after his beautiful nightmare single/video that sparked a billion blogs and arrived hot on the heels of Season 2 of his brilliant Atlanta TV series — elevates Gambino the live performer to stadium status, he promises this autumn's circuit to be the final one under the moniker given to him by the online Wu-Tang Name Generator. But surely it can be his last stand. There's too much charisma, too much funk and spirit and vision to contain this guy to a screen. "This isn't a concert," he warns early in his 76-minute tour de force performance. "This is church. If you're just here to hear your favourite song, you should go home and do that." The headliner is preceded by hardworking nightclub anthem creators Rae Sremmurd, also shirtless. The duo were just in town a few weeks ago in support of Wiz Khalifa, and threatened to steal the stage. Not this time. Despite Swae Lee's Herculean effort to rouse a crowd still trickling in, it's difficult to channel the spirit of Saturday at 2 a.m. on a sweaty dance floor at 7:30 p.m. on a Monday. After a 30-minute intermission, the main event begins. Leaning toward the freshest, more melodic material in his catalog, Gambino opens the proceedings with the days-old "Algorhythm," and it already sounds like a hit. There are flashes of Stevie, moves like Michael and scrunch-your-face grooves like Bootsy. What's missing are artsy song-paired videos and programmed backing tracks (yay!). Instead, a six-piece band — whom Glover thankfully introduces by name, an endangered concert element — is tucked into the orchestra, giving the stage a clean look, save for the spacey laser beams, and plenty of room for Glover to move. A fierce dancing troupe accompanies Glover's urgent rendition of the tour's titular track, and by the time he closes the encore with the wonderful "Redbone," you're happy you didn't bolt home to listen to your favourite song. "Dreamers," Childish Gambino says to no one and everyone in particular, "dreams come true."